I love rosehip tea and have been buying it from the supermarket for years. When I was pregnant, it was pretty much all I drank. 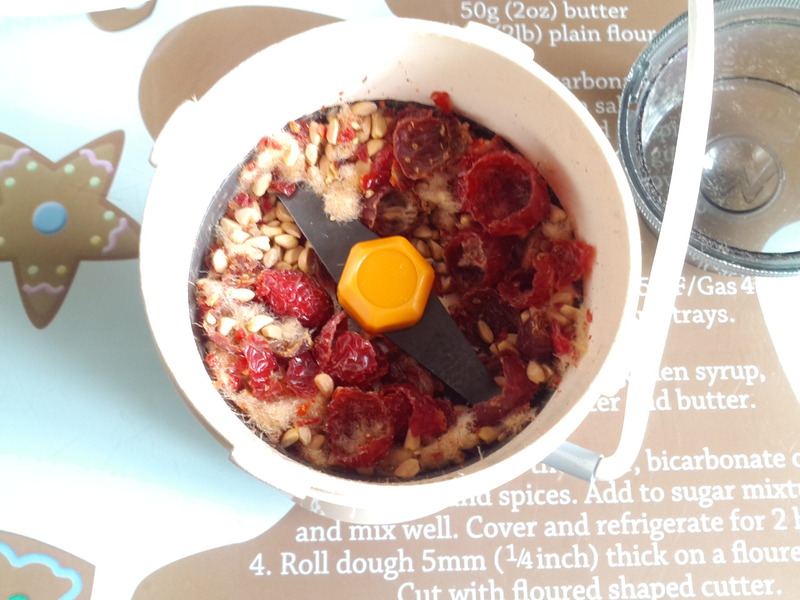 But, one by one, the supermarkets have stopped stocking it and I don’t much like the brand generally stocked by health food shops (too much hibiscus), so thought it was time to try making my own. I found a recipe at www.eatweeds.co.uk . No rosehips in my garden sadly so could I remember where I had seen some I could forage? I set out for a walk, with walking boots and a bag containing several containers, gardening gloves and secateurs. Spotted loads of lovely looking ones, all in people’s gardens! Eventually I remembered somewhere I had seen a single bush so headed there. Got a few strange looks as I cut the rosehips off with my secateurs but never mind. Found another larger bush a little further along. Thought I’d start small this year to see how it works, and keep track of more places for roseship locations for next year. 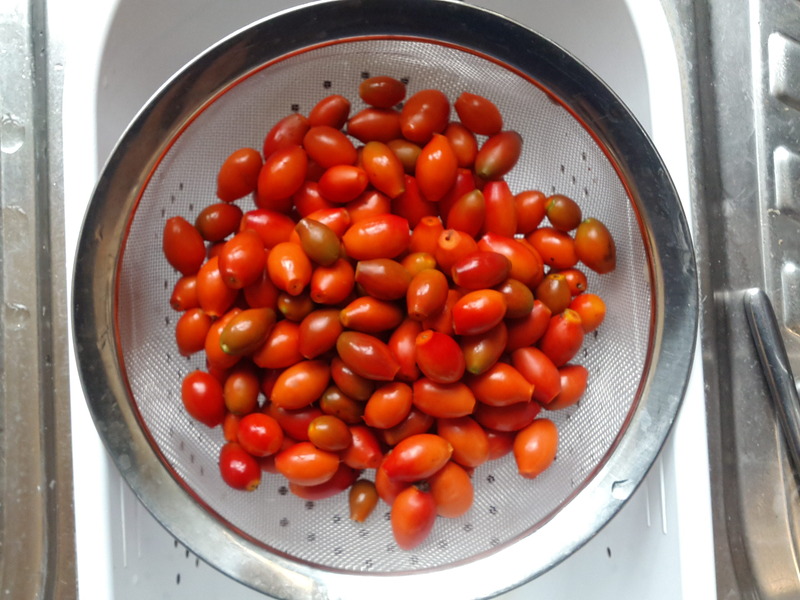 I started by giving the rosehips a wash and then trimming them. 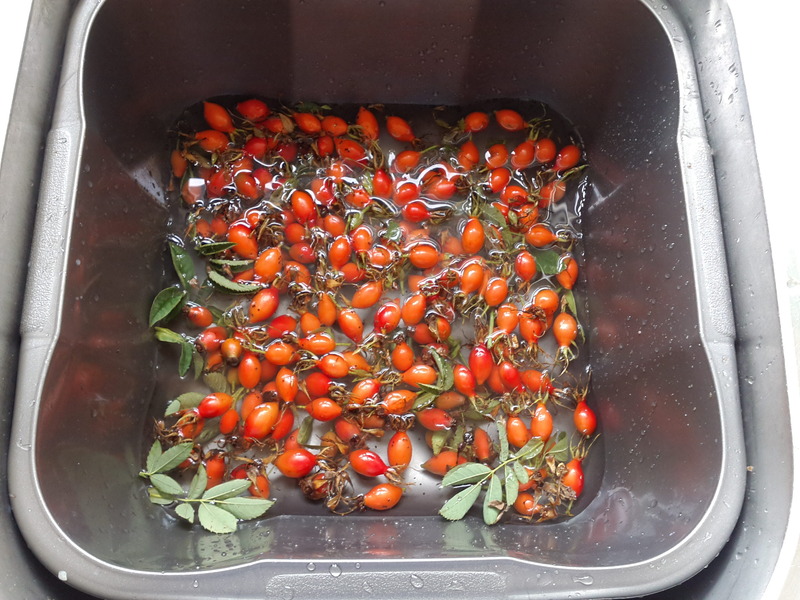 Rosehips getting a first rinse – I seemed to have brought along a few spiders too. 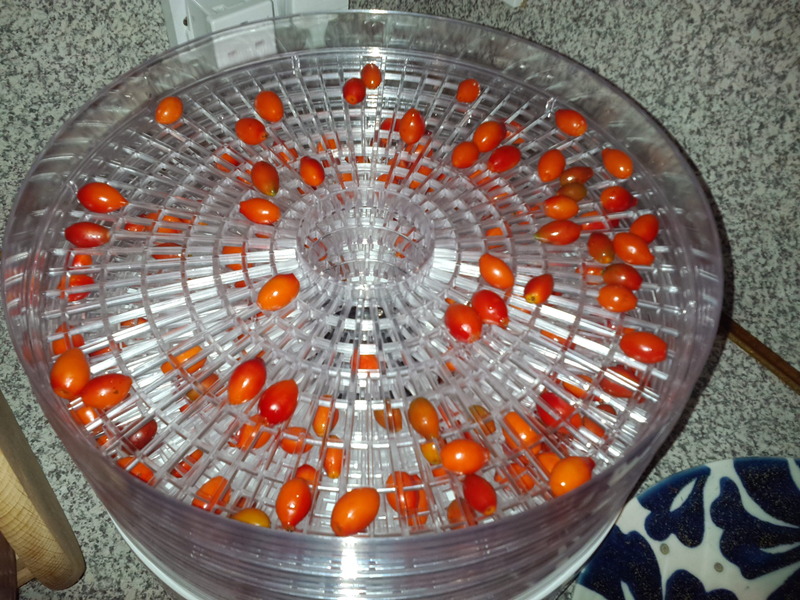 Then I popped them into my electric dehydrator – well spaced out. eatweeds reckons about 6 hours. Mine must have been large hips because I reckon they took 12-15, spread over a couple of days. Then I whizzed them up. As I’d read some hips are very hard and wasn’t really sure what type these were, I used a small coffee grinder which used to belong to my grandparents. 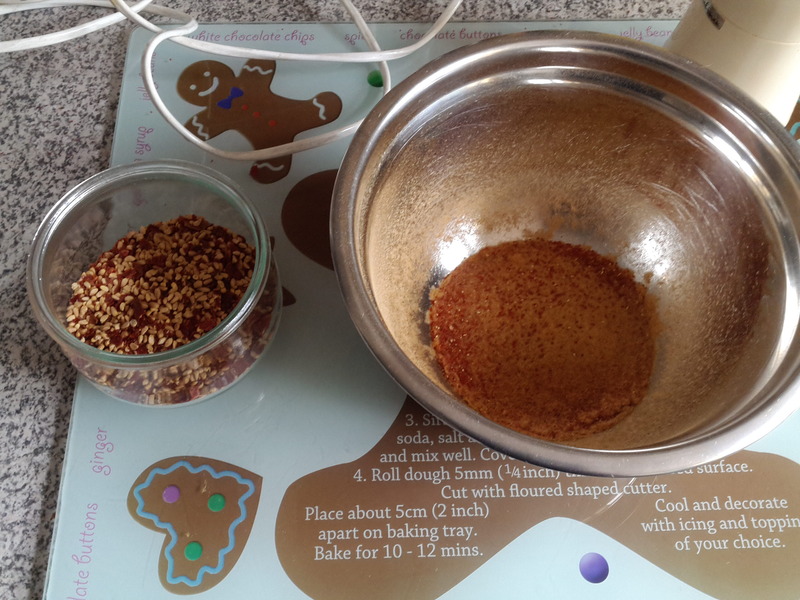 It worked a treat, in small batches, which also allowed me to experiment with how small to make them for sieving the hairs out. 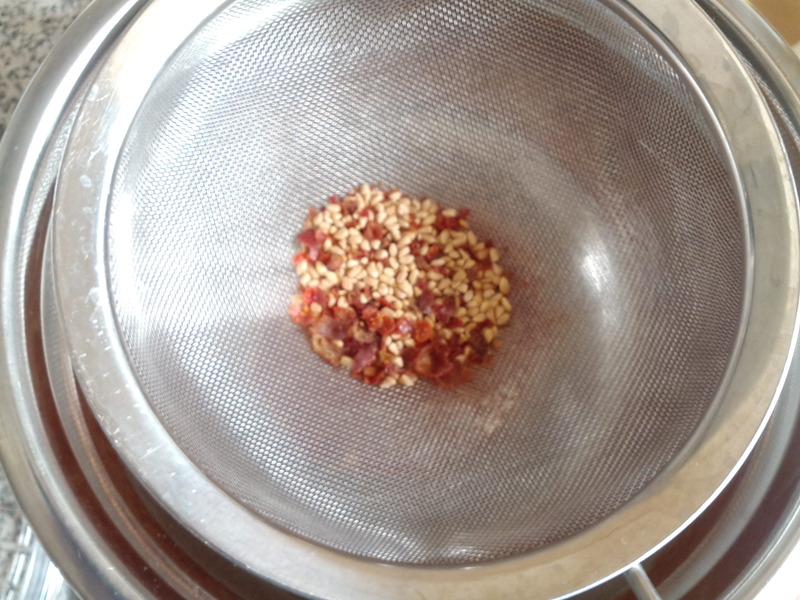 Images below show the sieved rosehip pieces and the hairs which were sieved out. I felt itchy for the next hour! Anyway, there you have it, dried rosehips for making tea. Washing and trimming was the most fiddly bit but really the whole process was quite simple so will be making a bigger batch next year. To make the tea you will need to infuse a spoonful or two in hot water and then sieve. 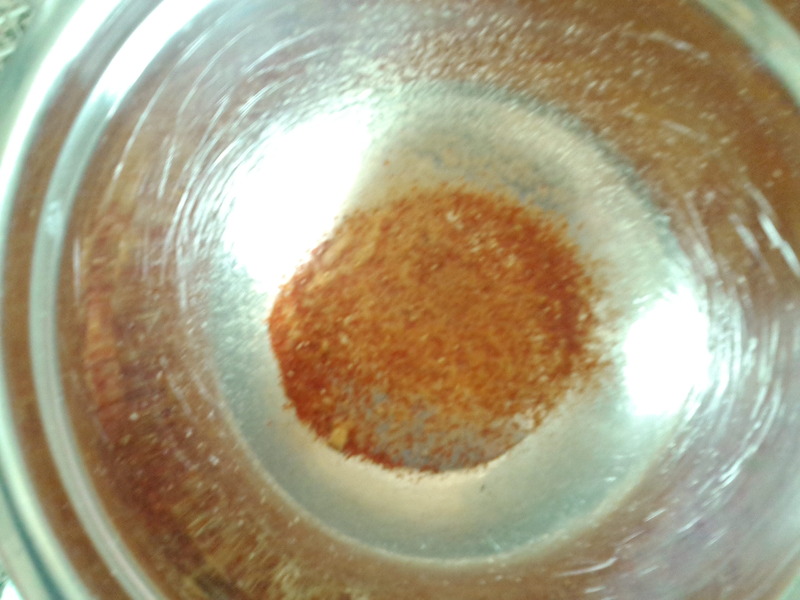 It won’t look as red as the purchased sort, but just made my first cup and it tastes pretty good. My walk also produced a 4th batch of damsons. 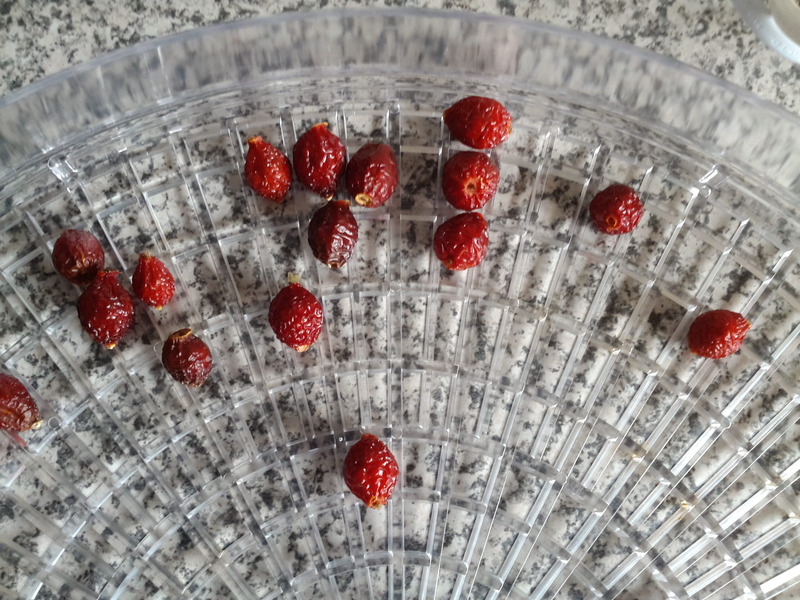 I’ve got some damson gin and vodka both on the go at the moment so for the moment have bunged these in the freezer to use later, when I can see which turns out best.